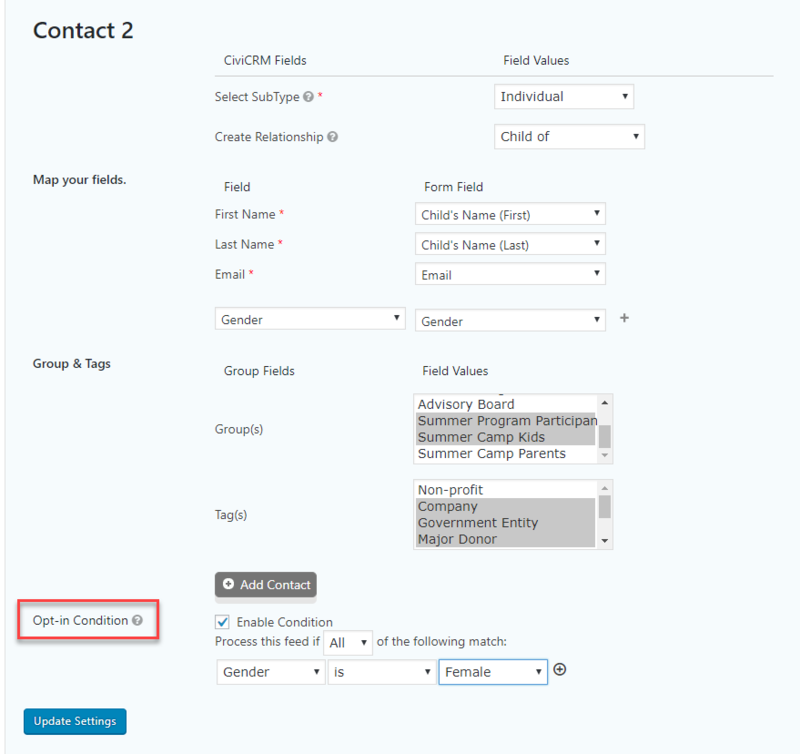 Once you have a form set up on your site, you'll want to create a CiviCRM "Contact" feed to get your contacts' data back into CiviCRM. 1. Open up your form and go to Settings Menu > CiviCRM Add-on. 2. Click Add New. Then give your feed a name and select which type of feed it is (Contact, in this case). Additional fields will be generated at this point, based on the feed type you chose. 3. 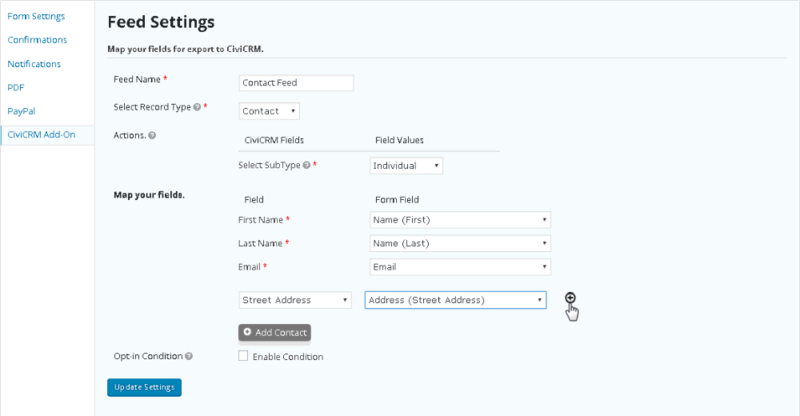 Choose your contact SubType, map the required fields, and then start choosing which other fields from your form you want mapped to this contact's record. 4. Decide if you want these contacts added to particular Group(s) or Tag(s). b. And choosing whether certain conditions must be met before form submissions can be exported into CiviCRM. 6. The Opt-in Condition is very handy for further segmenting your data. For instance, if we wanted to have all the Camp Kids signups that are girls go into a Summer Camp Girls group, we could set up 2 contact feeds. One would be as above but also select a Summer Camp Girls group. Then deploy the Opt-in Condition so that only those forms with Gender marked "Female" would be recognized by this feed. And then create a second Contact feed with an Opt-in Condition for Gender marked "Male" to go to a Summer Camp Boys group. 7. Go ahead and Update your feed settings, and you're done here! As I mentioned earlier, this feed is just for the Contact information. 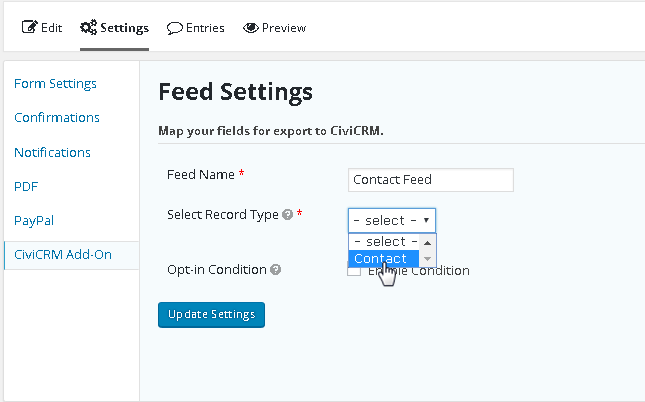 You'll create an Activity feed next so that the message portion of the form can be imported into CiviCRM as an Activity.